At first glance, the use of person-first language in nutrition counseling sessions and in all forms of media to describe clients and patients with health conditions may seem like the right thing to do. After all, many agree that the phrase “people with diabetes” does sound better than the term “diabetics.” But using person-first language is becoming more controversial among nutrition professionals and others in the medical community, calling into question whether its use truly avoids stigmatizing patients. In this month’s E-News Exclusive, Today’s Dietitian (TD) discusses the origin of person-first language and how it can be perceived in the health care community and among patients. After reading the article, visit TD’s website at www.TodaysDietitian.com to read the digital edition of the January issue, which includes articles on liquid meal replacements, the health impact of weight stigma, new guidelines for parenteral nutrition, and the role of RDs in natural disasters. On that last point, in 2014 the Rudd Center for Food Policy and Obesity, in partnership with the Obesity Society, the Obesity Action Coalition, the Obesity Medicine Association, and the American Society for Metabolic and Bariatric Surgery published Guidelines for Media Portrayals of Individuals Affected by Obesity. The latter two groups are no longer listed as contributors on the current version of the guidelines. The document offers suggestions for balanced and accurate media coverage that doesn’t contribute to stigma—useful for dietitians who work in print, broadcasting, or online media, or who write about weight-related issues in blog posts or newsletters. The guidelines also call for person-first language, as have the American Medical Association, the World Health Organization, and the Academy of Nutrition and Dietetics. High-protein diets may lead to long-term kidney damage among those suffering from chronic kidney disease (CKD), according to research led by nephrologist Kamyar Kalantar-Zadeh, MD, PhD, MPH, of the University of California (UC), Irvine. The review article, “Nutritional Management of Chronic Kidney Disease,” was recently published in the New England Journal of Medicine and examines the role nutrition plays in managing CKD, a condition that affects approximately 10% of the world’s adult population. The article release coincided with the opening of the annual Kidney Week Congress, the world’s premier nephrology meeting, in New Orleans. “The high-protein diet that has been used increasingly in recent years to control weight gain and obesity may have deleterious impacts on kidney health in the long term,” according to Kalantar-Zadeh, director of the Harold Simmons Center of Kidney Disease Research and Epidemiology, and chief of the division of nephrology and hypertension at UC Irvine School of Medicine. Colleague Denis Fouque, MD, PhD, of the University Claude Bernard Lyon in France, also contributed to this work. Plant-based probiotics, chicory root fiber, and cottage cheese are among the food stars of 2018, according to predictions from The Washington Post. Runner’s World outlines the efficacy of dairy and nondairy milks for runners and other athletes. Teaching children to cook is the best way to raise adventurous eaters and form good nutrition habits for life. In my nearly 12 years of being a mother, some of my favorite memories with my children have occurred in the kitchen. Watching them go from chubby-fingered toddlers playing with their food to helpful and adept preteens who can prepare their own meals has been a shining progression and a source of pride. • Should RDs Embrace the Term ‘Natural’? Learn the current research on triglycerides and recommendations and strategies RDs can use to counsel clients to manage and prevent CVD in this month’s issue of Today’s Dietitian. Read the CPE Monthly article, take the 10-question online test at CE.TodaysDietitian.com, and earn two CEUs! Save 18% when you purchase CEUs in January! Registration rate $349 through January 31! REGISTER NOW! 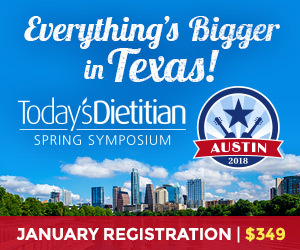 Start your 2018 Spring Symposium experience a day early and join our Nutrition Editor Sharon Palmer, RDN, on Sunday, May 20, 2018, as she takes you on a tour of local farms and food organizations in Austin. This all-day, exclusive event is limited to only 40 attendees. Space will be awarded on a first-come, first-serve basis and tour participants must be registered for the 2018 Symposium to attend. 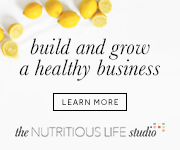 Space is limited, so register now!